Remarks on Congress president Rahul Gandhi should not be taken as a personal attack, Amit Shah said. 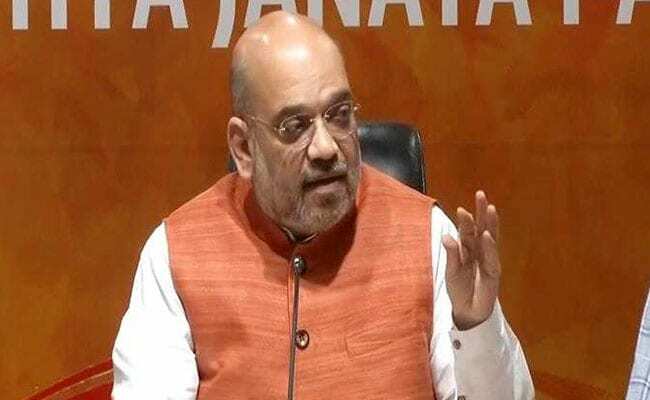 Raipur: BJP chief Amit Shah today asserted that the opposition has a key role in a democracy and said his party's slogan of "Congress-free India" means freeing the country of that party's "culture". He also said his some of the remarks on Congress president Rahul Gandhi should not be taken as a personal attack as he had only replied to certain questions posed by the opposition party leader. "'Congressmukt Bharat' means getting rid of the 'Congress culture'. Democracy is not possible without the opposition. It is a different thing that the Congress has been shrinking in the country," he said. "But it is the responsibility of Rahul Gandhi to keep the Congress alive, not mine," Mr Shah said, when asked if the BJP wanted to wipe out the opposition from the country. He was addressing a press conference at Ambikapur town in Chhattisgarh's Surguja district before leaving for New Delhi after his two-day visit to the city. To a query on constantly targeting Mr Gandhi in his speeches, Mr Shah said, "It should not be considered as a personnel attack. He (Rahul) put forth some questions to which I answered." The BJP has done good work and therefore, it is getting support of the people. "If we continue doing good work, people will continue to support us," he said. He said Mr Gandhi was asked to give an account of the four-generation rule of his family as it was in power for 55 years. "Being the present party chief, Rahul Gandhi had to answer about the Congress legacy and I have to answer on the BJP's legacy. It should happen in a democracy and there should be no objection over it," the BJP president said. To a question on the middle class apparently distancing itself from the Modi government, he said the centre has been working while keeping in mind benefits of all sections of society and a propaganda was being spread that the middle class has turned away from the BJP. "The party won elections with the support of the middle class in 14 states," he noted. Mr Shah also highlighted the benefits and achievements of various schemes launched during the four-year rule of the NDA government at the centre led by Prime Minister Narendra Modi. He said maximum number of terrorists were killed in the last four years while (international) borders were protected. The government has a better Kashmir policy and has been keeping an eye on the situation in the valley, he said. Mr Shah took a jibe at former Prime Minister Manmohan Singh, saying when he used to go on foreign tours, nobody knew about it but when PM Modi goes abroad, "he is welcomed" by people of those countries and Indians based there. Hailing Chief Minister Raman Singh-led BJP government in Chhattisgarh, Shah said it has transformed a backward state into a developed one. Chhattisgarh was part of the erstwhile Madhya Pradesh. In 1980s, Madhya Pradesh was recognised as a 'Bimaru' state as a result of long rule of the Congress. When Chhattisgarh was formed and the BJP came to power in 2003, it rapidly headed on the path of development and made its way into the list of developed states, Shah said. Chhattisgarh has now become a power surplus state, Naxalism has been controlled, road network is being laid, agriculture production increased, and transport and communication services expanded in remote areas, he mentioned. Naya Raipur - the upcoming capital of the state - is being built and many more development works have been done by the Raman Singh government, he said, claiming that several state governments were taking lessons from Chhattisgarh. The senior BJP leader exuded confidence that his party would retain power for the fourth straight term in the state, in the Assembly elections due later this year. Mr Shah said after witnessing a huge response during his programme in Ambikapur yesterday, he was confident that the BJP will achieve the target of clinching 65 out of 90 seats in the state Assembly polls. The BJP chief yesterday arrived on the visit of Ambikapur. He had held a road show in the town followed by addressing a public meeting as a part of Raman Singh's 'Vikas Yatra' campaign to highlight achievements of the 15-year rule of his government, ahead of polls in the state.